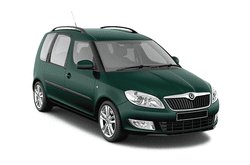 Skoda's excellent reliability speaks for itself and has earn the brand a reputation for the highest quality when it comes to their vehicles. With a great interior design and a strong outside build quality, you can enjoy a spacious cabin and distinctive styling as you cruise the streets. With good fuel ratings, great power delivery, easy handling, and all the comfort accessories you want and need, the Skoda Roomster is quickly becoming a popular choice for many. It has great power and control and blends luxurious comfort with luxurious style in a vehicle that is user friendly and attainable by all. Check it out and make your reservation today before the Skoda Roomster is gone!